As I have stated in prior posts, I have no intention of lessening my quality of life when we move to the new homestead. I will change many of the ways I do things, but the quality of the end product will not be reduced and the method will not be torture. A ton of folks complain about laundry, which astounds me because, really, the machines do all the work. I just add soap and fold. The machines do the rest. On my new homestead we intend to be off the grid as much as possible. This means my homestead will be people powered, solar powered, or wind powered as much as possible. 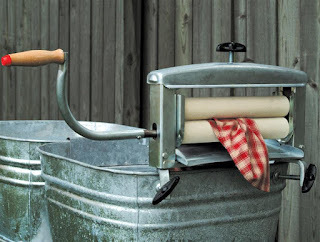 While I will have a washing machine and a dryer, I intend to only use them when absolutely necessary so that I don’t have to rely on a petrol based generator to do wash.
After researching laundry off-the-grid style, I feel confident that I will be able to continue to do wash quickly, efficiently, and without great gobs of sweat. I won’t be taking my wash down to the river to be beaten on a rock. No, I will have a system in place that will do wash assembly line style. Interested to learn how to do laundry when you are off the grid? Keep reading and I will share all my secrets. Ok, so what are the next steps? Well, you have to assemble your laundry system. First, you will need a Clothes line. Then you will need tubs to wash the loads of laundry in. 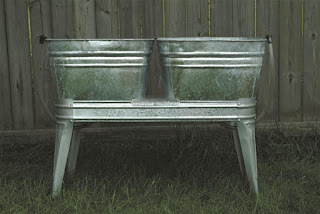 I chose to get two galvanized tubs on a stand. They have drop down hoses to drain easily and are at a height that is nice to my back. Plus, I figure if I decided washing clothes manually wasn’t for me, I could use them as planters. These were pricey at $219 plus shipping, but I think they were worth it. You could actually use a couple of 5 gallon buckets for this purpose, but again, I am not going to live like a mountain man. 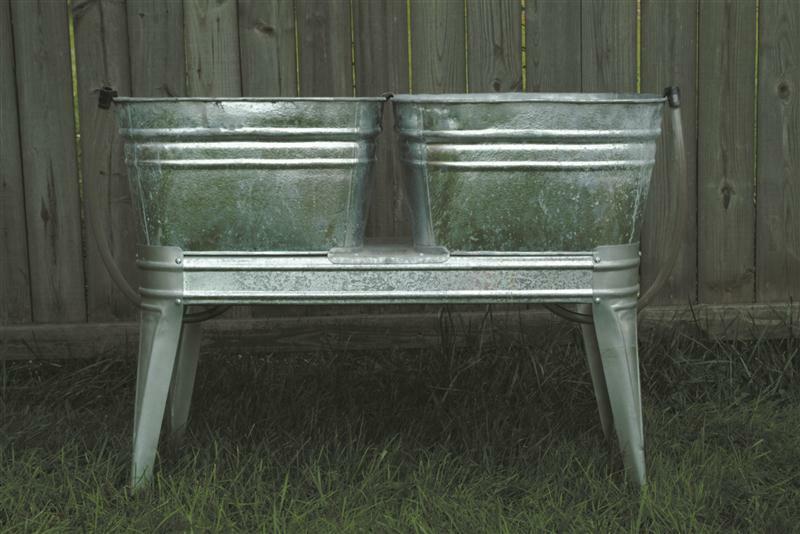 I am maintaining my quality of life and these galvanized tubs are my choice. 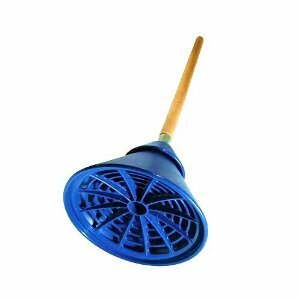 Notice that it has a plunger shape, but the underneath is completely different. I have seen some handmade Rapid Washers from modified plungers, but I prefer this style. It really moves the soapy water very effectively. Before proceeding I should tell you that 9” of snow fell on our property yesterday. There is no chance I am going to go outside to do wash. The bonus with the Rapid Washer and a wringer is that they can be used in our bathroom, attached to our galvanized stock tank tub. I then hang items to dry on the fold down rack I found at IKEA. Clothes will dry outside even when it is cold, but they take longer. When I am having a time with weather like right now I wash only important items like skivvies and socks, jeans and heavier items can wait until the weather clears up. The next item you are going to need is laundry soap. It takes far less laundry soap in this system than in a washing machine. If you are going to drain your grey water into a container or system to water plants, you will want to make sure you use biodegradable laundry soap. I chose to make my soap at home for a long time, but I have decided to also try Dr. Bronner’s Liquid Castile Soap. I have heard great things about it and it can be used in so many different capacities including general cleaning, washing dishes, shampoo, body wash, etc. The key is the dilution which is the ratio of soap to water. For my washing purposes here are the dilution suggestion is one Tablespoon for every five gallons of water. For commercial laundry detergent you will have to experiment and, unless you are draining into a black water tank, make sure you are using biodegradable detergent. I do not use fabric softener in my rinse EXCEPT if the fabric causes a ton of static cling or the fabric I am washing is bedding such as sheets and blankets. Ok, so you have assembled your laundry team and are ready to begin. Separate all your wash by colors and type. I wash towels and sheets separately from whites, darks, colors, and diapers. When washing whites use hot water to prevent yellowing, but DO NOT add Chlorine bleach. Chlorine Bleach should not ever go into a grey water system. Seventh Generation makes Peroxide based bleach that is safe for grey water systems, but NEVER use Chlorine based bleaches. Shop around and read up on grey water systems to find suggestions of other brands of soap that biodegradable. Fill both tubs with clean water of the proper temperature for the items you are laundering. Add the proper measurement of soap. Stir it around to disperse it. Add your load of wash. Using the Rapid Washer, agitate the clothes by moving the rapid washer up and down. I do this initial motion for about a minute to make sure the load is thoroughly wet with the soapy solution. Then I walk away and do other things for about 15 minutes, allow time for the soap to begin working on the dirt and oils in the fibers. After a time I go back and agitate it some more. How long I let it soak and how long I agitate it is based on the type of fabric and how dirty it is. After washing, run each garment through the wringer and allow it to drop into the rinse water. This is the rinse bath where you should add fabric softener if you are going to use it. Once you have all the clothes in the rinse water, drain the soapy water tub and add fresh water. Agitate the clothes in the rinse tub a few times with the rapid washer and run them through the ringer and allow them one final rinse in the final rinse tub (which is the tub that used to have soapy water in it). Once the clothes have been run through the ringer into the fresh water, you can drain the first rinse tub. Your clothes, by this time, are nice and clean. Run them through the ringer and drop them into a clean basket, take them to your clothes line and hang them up. You may want to add soap to the second tub of rinse water which again becomes the first tub with soapy water. And so the cycle continues. 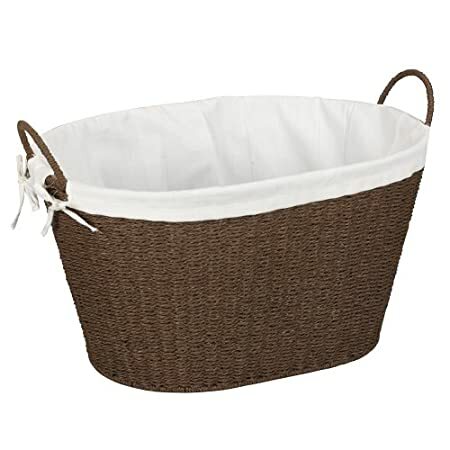 · Reusing water (with the exception of using the last rinse water tub to wash the next load) to do all your laundry (whites, lights, darks, towels, sheets, etc.) will lead to a wicked case of lint. Unless you have to conserve water due to circumstances, don’t try to do all of your laundry in one tub of soapy water and one of rinse. · If you use find your fabrics are stiff after drying on the line, you are most likely not getting all the soap residue out of your clothes. Don’t skip the extra rinse and consider adjusting the amount of soap you are adding. Fabric softener will not cure stiff clothes due to soap residue. In fact, it will add to stiffness if too much is used. · Don’t hang your laundry directly in the sunlight. Air should dry your clothes, direct sunlight will bake them. Use direct sunlight and a bit of lemon juice to naturally bleach out whites, but hanging dark clothes and such directly in the sun will do nothing good for the fibers not to mention fade the colors. · To hang your clothes out even when it rains, consider using a tarp to create a tent over the line to keep the clothes out of rain and out of direct sunlight if you don’t have a shaded line. This will do wonders for your laundry and allow you to dry clothes even when it is drizzly or raining on and off. Plus, this keeps bird poo and tree sap off of your clothes as well. Have suggestions, questions, or ideas about doing wash off-the-grid? Leave me a comment below. My Kitchen is Coming Together!!! !